A year ago, Hurricane Maria roared across Puerto Rico and became one of the worst natural disasters ever to strike the island. CNN was there when the storm ravaged the U.S. territory and has reported on the crisis ever since. CNN’s reporting included suing the government for vital statistics to more accurately report the death toll, investigating why critical supplies were not immediately distributed and telling the stories of people who continue to struggle months after the storm. CNN correspondent Leyla Santiago, who has spent over a 100 days in Puerto Rico in the past 12 months, and senior investigative reporter John Sutter were the first reporters to survey funeral homes, revealing that the death toll could be nine times higher than what the government was reporting. Now, on the first anniversary of the deadly storm, CNN’s Bill Weir, Leyla Santiago, and John Sutter take viewers to Puerto Rico to look at the continuing challenges to rebuild, the successes and failures of government agencies involved in the recovery process as well as the ongoing human toll. The one-hour special will air on CNN Friday, September 21st at 10 PM ET/PT. 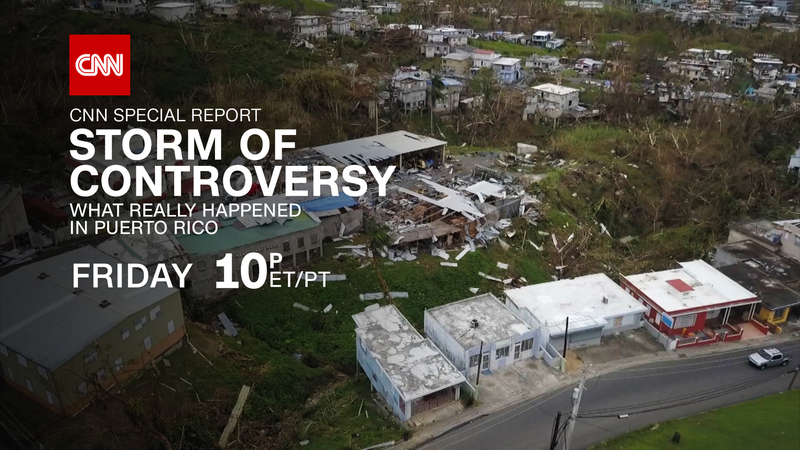 Storm Of Controversy: What Really Happened In Puerto Rico will also stream live for subscribers on Friday, September 21st via CNNgo (at CNN.com/go and via CNNgo apps for Apple TV, Roku, Amazon Fire, Samsung Smart TV and Android TV) and on the CNN mobile apps for iOS and Android. The special will also be available the day after the broadcast premiere on demand via cable/satellite systems, CNNgo platforms and CNN mobile apps.